We just about managed to get the Whiting Competition in, the weather was not ideal, but the forecast for the wind was fairly light. There was some sunshine, but a deep low brought with it wind, lighting, and rain. This meant an hour in the cabin whilst it passed over, and then carry on fishing afterwards. 10 members were out fishing, but the Whiting were all rather small, mostly too small to weigh in. However, myself and Mike Whiting did get fish to the scales, with mine, at just under 13oz, turning out to be the biggest of the day. This win means I finish as Accumulator runner-up behind Mike Whiting, who is our worthy 2014 Competition Accumulator Champion. 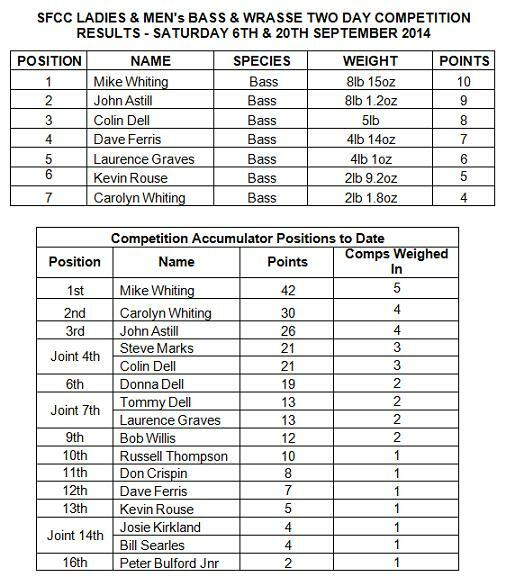 The Accumulator has now produced a different winner each year, and I know that if some people had weighed-in their fish they would have been up there challenging for the first six places. 2014 has certainly been the best for a number of years. Just a reminder of the Annual Fishing Group Meeting, which will be held on Friday 21st November. And Presentaion Night is Saturday 17th January 2015. John Astill - Fishing Secretary. 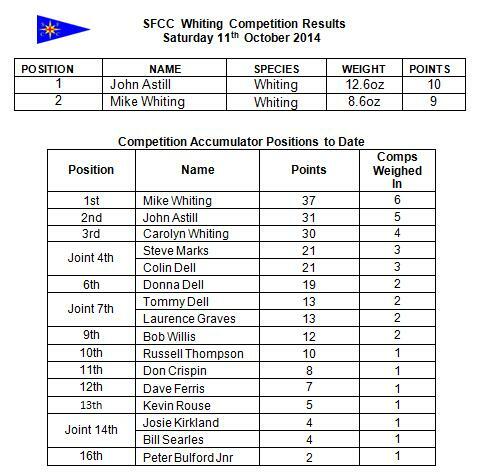 New date(s) for the Whiting Competition are Saturday 11th October, or Sunday 12th if the better day. 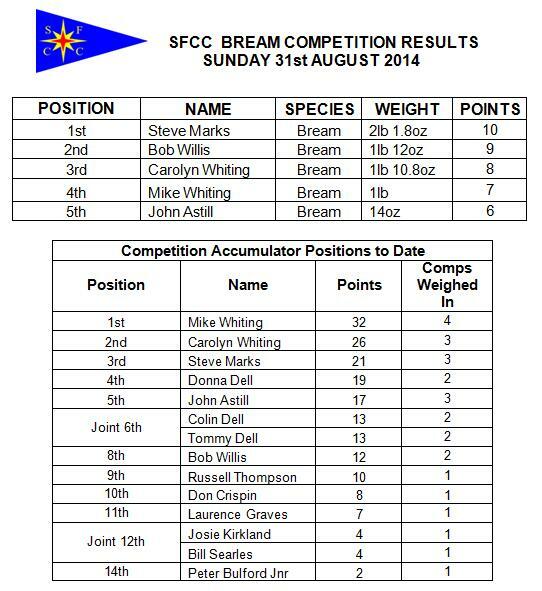 The first days Bass and Wrasse Competition was held on 6th September 2014. It was a perfect day to be out on the boat with a fishing rod in your hand. There were 20 members fishing, and it was good to see Dan Pike and his family down for the competition, as well as three of our ladies out with us too. Everyone struggled to catch any decent Bass, except Dave Ferris and Laurence Graves, who fished a particularly productive wreck, but their biggest fish was only just over 4lb. There was just one Wrasse weighed in by Kevin Rouse, at 3lb 3.8oz, fishing from his RIB. The second days Bass & Wrasse Comp took place on the 20th September, after two postponements due to bad weather. With light winds and sunshine forecast for this day there was everything to play for. It was another good turnout by our members, all eager to beat Dave Ferris’s Bass of 4lb 4oz caught on the first days Bass & Wrasse comp, and Kevin Rouse’s Ballan Wrasse of 3lb 3.8oz. There were three Bass caught over the 4lb mark, Colin Dell 5lb, John Astill 8lb 1.2oz, but the biggest Bass was Mike Whiting’s fish weighing 8lb 15oz, caught aboard his boat ‘Our Molly’. Well done also to Carolyn Whiting for catching her first Bass while ‘wedging’. Bill Searles, (also known by many aliases), caught 3 Wrasse, the biggest of these being a Ballan Wrasse of 3lb 12.6oz, caught aboard his boat ‘Louisa’. This won him the Men's Wrasse part of the competition. Mike Whiting is now virtually uncatchable in the Competition Accumulator, but the other placings are still all uncertain. Just a reminder that our next, and last competition of the season, the Whiting Competition, will be held on either Saturday 4th October or Sunday 5th October, weather permitting. Subject - 2 Day Bass and Wrasse Competitions - Rescheduled Date. Day 2 has been rescheduled for Saturday 20th or Sunday 21st September, weather permitting. Day 1 was fished on Saturday 6th September. Day 2 is scheduled for Saturday 13th or Sunday 14th September, weather permitting. Weather and sea conditions were very good, and there were a large variety of species caught by quite a few of us. It was a case of rods down, feet up, and enjoy the sunshine. With only five members weighing in Bream the biggest of these was caught by Steve Marks aboard "J's Pleasure", a Bream of 2lb 1.8oz. This sees Steve Marks move up to 3rd place in the Accumulator, though still well behind Mike Whiting. With only the Bass and Wrasse Comp and Whiting comp, Mike looks untouchable. The rescheduled 1st days Ladies and Mens Bass & Wrasse Comp will be held on Saturday 6th September or Sunday 7th, weather permitting. The Conger Comp was held on Sunday 24th August. The weather was good, though ideally we could have had a smaller tide, but as it was rescheduled we had no option but to hold it on that day. There was only one Conger caught and this was by Colin Dell aboard his boat “Dreamcatcher”, a fish of just over 21lbs. We certainly had a big one hooked up on J’s Pleasure, but unfortunately it snapped the 65lb hook trace, then shot down to the bottom never to be seen again. The posponed 1st days Bass & Wrasse comp will be held on Saturday 6th September or Sunday 7th, weather permitting. New date(s) for the Conger Competition are Saturday 23rd August, or Sunday 24th if the better day. 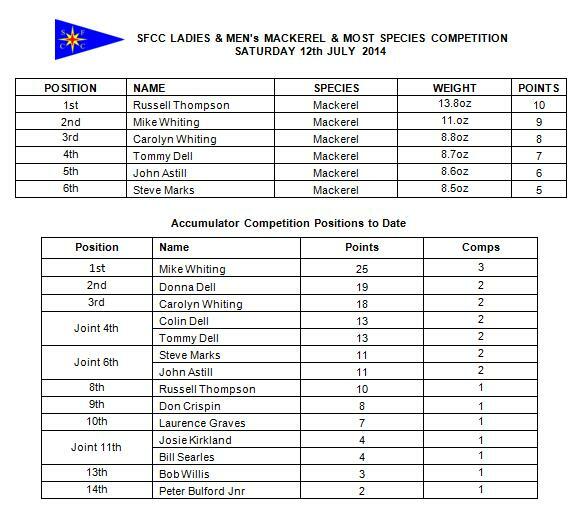 The Ladies and Men's Mackerel and Most Species Competitions took place as scheduled on Saturday 12th July. Unfortunately, it also clashed with another club event, but still 16 members participated in the competition. A special thanks to Dan, Karoline, Thomas and Nicky Pike, with friends, for coming down from Potterne in Wiltshire especially to take part in this competition. It was also nice to see Russell out fishing with Mike and Carolyn aboard ‘Our Molly’. He doesn’t seem to have lost his touch with a bag of 7 species, and one of the species was a Grey Gurnard. An unusual fish, though not rare. He made a clean sweep of both elements of the competition by also catching the biggest Mackerel of 13.8oz, so well done Russell. Carolyn Whiting had the best Ladies Mackerel of 8.8oz. To remind you that the next competition will be for Conger on Saturday 2nd August, or Sunday 3rd August, if it’s the better day. Also, August is a very busy month for fishing competitions. Interclub Competition with Exmouth is on Sunday 10th August. They are hosting the event at Exmouth Sailing Club. This is a two fish specimen contest where SFCC basically need to get better fish landed and weighed-in than Exmouth. Ladies and Men's Bass and Wrasse Day 1 is on Saturday 16th August or Sunday 17th August. The Black Bream Comp is scheduled for Saturday 30th and Sunday 31st August, weather permitting. 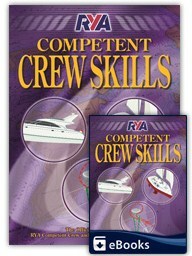 The next competition will be the Conger Comp on Saturday 2nd August or Sunday 3rd, if it's the better day. This Flatfish competition, is the first competition that the active fishing members voted on to take place over two days weather permitting, and by looking at the number of boats and people taking part, it seems to have gone very well. 11 boats and 23 members were fishing on the Saturday and 5 boats fished on the Sunday. Some members fished on both days which totalled 30+ members fishing over the two days. The tide was not ideal, but those who stayed and fished the river on both days certainly did much better than those looking for Plaice along Exmouth seafront. Again the ladies seem to have done very well with Carolyn Whiting's Flounder of 1lb 5.8oz taking first place fishing aboard 'Our Molly', and Donna Dell in second place with a Flounder of 1lb 3.2oz fishing aboard 'Dreamcatcher'. They are proving a force to be reckoned with, and if this continues I think we will have to make the rule that they bait up their own hooks, tie their own knots and net their own fish with one hand behind their back. Well done ladies. We have a break next month from competitions. Please see below. The next competition will be the Ladies and Men's Mackerel and Most Species on Saturday 12th or Sunday 13th July. With light winds and sunshine forecast and many Pollack being caught the week before, we had all the ingredients for a good competition. There were 17 members fishing aboard 8 boats. With only 3oz between 1st and 2nd, Donna Dell taking top spot with a fine Pollack of 9lb 6.6oz aboard Dream Catcher, and Mike Whiting in 2nd with a Pollack of 9lb 3.6oz fishing aboard Our Molly. Bill Searles's grandson Peter Bulford did extremely well with his Pollack of 4lb 2oz. The majority of fish weighed in were over 5lb, so let’s hope this is a good omen for the rest of the year. 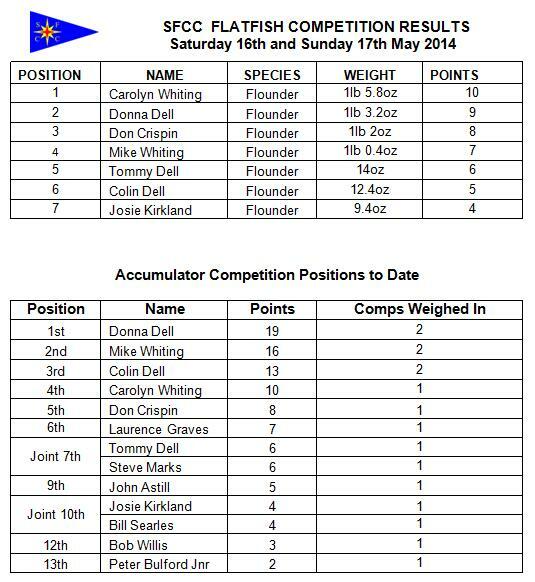 The next competition will be the Flatfish on Saturday 17th or Sunday 18th May. 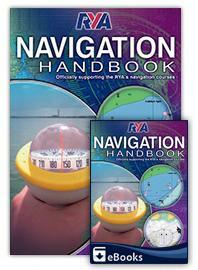 Look forward to seeing you all on the water. 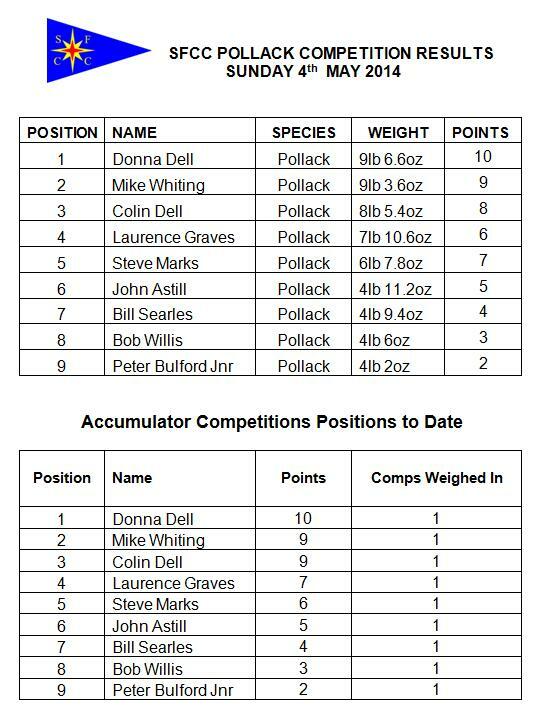 After a poor weekend for fishing weatherwise, the Pollack Competition is now set to take place on Saturday 3rd May, or Sunday 4th May, if it is the better day. The recent weather has been partly instrumental for moving sand and the approaches to the Exe. Therefore channel depths may have changed for the worse in places and until a survey can be achieved boaters should navigate with caution, stick to the buoyed channel and ideally wait until the height of tide is high enough to allow safe passage of your vessel. It should be noted that the estuary always has been a bar harbour and therefore should only be passaged at a suitable tidal state depending on your draft, preferably on a rising tide. When the weather has settled, we will carry out a survey of the channel ensuring again that the buoys are positioned such that they are marking the deepest part of the channel. • What a great year for John Hall aboard his own boat 'Blue Mist' - John won 3 competitions to take the prestigious award of 'Club Competition Accumulator', 'Best Boat Specimen' with a fine wreck caught conger of 55lb (which is also a new '>2000 Club Record'), a new 'All Time Club Record' Coalfish and the title of 'Fisherman of The Year' with a total of 447% (6 different species). • Carolyn Whiting also had her best year yet, winning all the ladies competitions and trophies (with no awards this year, her husband Mike must have either been making the tea or asleep!). • It's good to see one of our 'Old Salty Sea Dogs' Paul LeMilliere featuring within the trophies again - even though it was for one of our most prolific of pelagic species, the common Mackerel! • The 'Deep Sea Duo', Dave & Laurence struggled to find many quality fish. Dave had an impressive 'Deep Sea Bag' of 4 Pollack early in the year totaling 47lb however Laurence managed to tempt the biggest specimen to his lure, a fine Pollack of 13lb 8oz. Laurence also smashed the '>2000 Club Record' Ling by 10lb - a whopper of 13lb 10oz! • John Astill has maintained his reputation as one of our top Bass anglers, although this may be slipping away from him as this year he's sharing the trophy for the biggest Bass with Steve Lomas, another fine angler who's catch record is going from strength to strength. Steve also comfortably took the 'Bass Bag' with 4 Bass totaling 23lb 3oz! • Kevin Rouse, who was on his so say 'Year of Rest', still managed a few quality Plaice from our local marks aboard his new RIB 'X-PRO'. He also won the 'Men's 2 Day Bass Comp' from his new vessel showing all those wreck anglers that the big'uns aren't always a million miles out to sea! • Winner of the dinghy in our Christmas Draw, Bob Willis, enjoyed his day afloat fishing for the Black Bream, catching the heaviest on the day, a fine specimen of 2lb 2oz! He's been told that next year he's being towed out to the Tardice to fish alone in his dinghy! • The 'Dell Boys'(Tommy and Colin), battled against each other in the 'Men's Most Species' but neither caved in resulting in them sharing the trophy - a draw of 5 fish each. • Up and coming junior angler, Jack Bulford (Bill Searles grandson) fished hard this year aboard his Granddad's boat 'Louisa' to take both top junior awards - Junior Best Specimen of the Year & SFCC Junior Fisherman of The Year. I'm sure we'll see more of this enthusiastic angler next year! Kevin Rouse - Fish Recorder.